Remember that old reality show “Monster Garage?” Well, it’s got nothing on our transportation equipment technicians who are truly experts in the field of fabrication. They also know how to reduce, reuse and recycle in a big way! 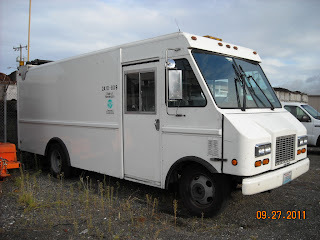 Earlier this year, the bridge crew’s old 1998 Chevy utility van (which looks like a bread wagon) needed to be replaced - the old “bread wagon” was turning into a rusty bucket and it didn’t have enough room to carry the crews and the big pieces of equipment needed to maintain thousands of bridges. Assistant bridge superintendent Rick Rodda explained to the equipment techs that what the bridge crews really needed was a heavy-duty crew-cab truck with a van body. So, the equipment techs went to the drawing board and got creative. The result is truly a one-of-a-kind truck. 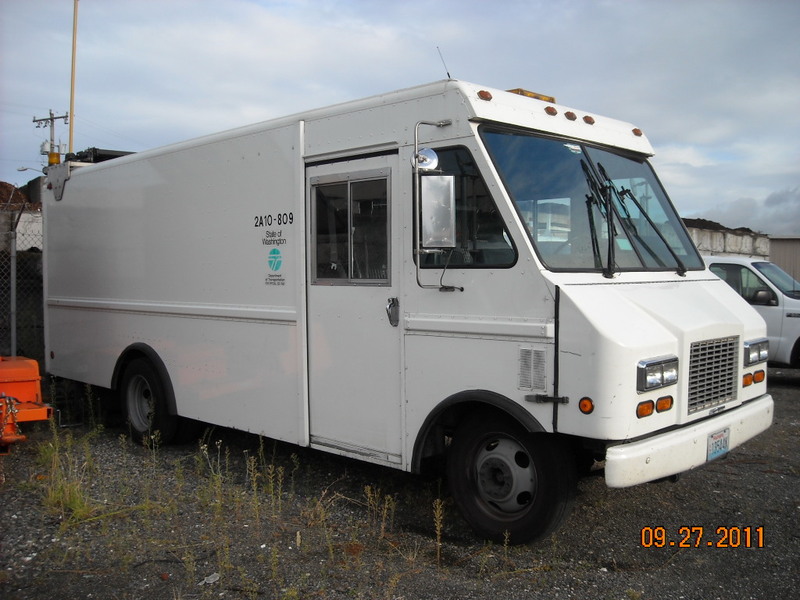 As luck would have it, the Ferries Division had recently turned in an old warehouse van. The techs took one look at it and were inspired. They tore the 18-foot-long van body off. Then they bought an International 4300 crew-cab chassis. And then took these two different pieces and built a custom truck exactly to bridge’s specifications while staying within budget. But the techs aren’t done! The chassis from the dismantled ferry warehouse van has some life left in it yet. The techs plan to use that when they build a new traffic-control truck, known affectionately as a “Road Warrior.” In fact, most of our “new” vehicles, like traffic and maintenance trucks, go into our shop first before they get used in the field. They don’t arrive ready to go, at least not quite ready for what we need them to be able to do. Our mechanics install radios, computers, customized tailgates, lighting, etc. The vehicles are specially modified to do exactly what we need them to do. Hats off to our equipment techs who routinely find unique ways to solve problems, build and maintain complex pieces of machinery, and do it within budget. “Monster Garage,” eat your heart out. Narrow rural highways don’t meet today’s safety standards and tomorrow’s driver expectations. 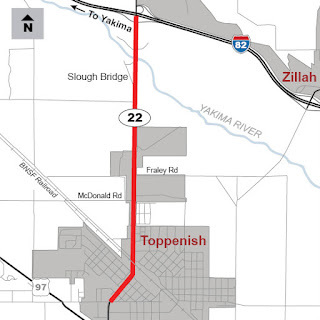 That’s why our engineers saw the need to make improvements to State Route 22 through Toppenish. Forty-seven collisions occurred along this mile and a half corridor since 2005. This summer and fall, our contractor was busy enhancing the corridor as part of the $4.63 million SR 22 – I-82 to Toppenish – Safety Improvement project. Crews widened the shoulders from one foot to four feet. A wider highway gives drivers who stray from their lane due to inattention or other reasons, a better chance of recovering control and getting back on the right path without damage or injury. Crews also decreased the risk of collisions by adding guardrail, signs and striping. 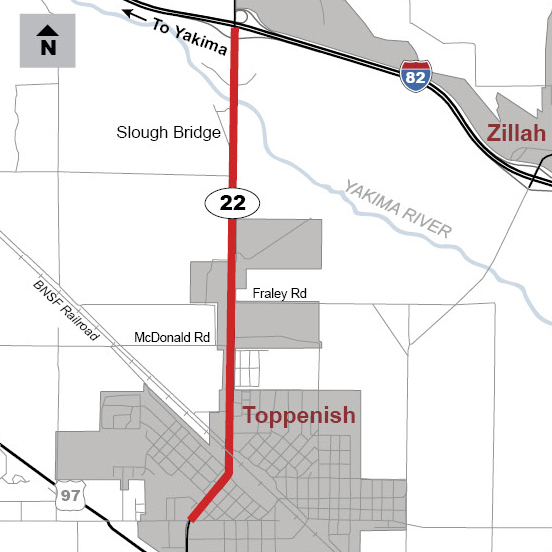 Since SR 22 passes through the city limits of Toppenish, the project includes upgraded pedestrian facilities such as sidewalks and ramps to meet Americans with Disabilities Act requirements. Crews constructed left and right turn lanes at two major intersections where the posted speed limit is 50 miles per hour – this will help reduce rear-end and enter-at-angle crashes. Now, all that’s left to do next spring when the weather is warmer is place the final layer of asphalt on the roadway and install permanent striping; this will make a better corridor for drivers, pedestrians and bicycle-riders. Halloween is upon us – the time of year filled with pumpkin carving, haunted houses, parties, and of course, trick-or-treating! When contemplating what to dress up as this year, don’t forget the most important thing that should accompany every Halloween costume—SAFETY. Kids of all ages taking to the darkened streets on a quest for candy can present any number of traffic hazards, so it should come as no surprise that October 31 is the deadliest night of the year for pedestrians. Remember, costumes do not come with magical powers. Pedestrians, especially young children, are even more vulnerable walking around after dark in poorly lit or high traffic areas. While Halloween and horror go hand-in-hand, there’s nothing scarier than a child being hit by a car because they weren’t able to be seen by the driver. Walk—don’t run—in groups or with a trusted adult. Attach something reflective to your costume or candy bag. Carry a flashlight or wear something lit, such as a glow stick, make yourself more visible. Walk on sidewalks or on the edge of the road facing traffic to be easily seen. Avoid potential hazards by not cutting across yards or driveways. Cross at a crosswalk or an intersection whenever possible. Make eye contact with drivers to ensure they see you before crossing. Set a curfew of 9:00pm to avoid being out too late after dark. Be extra mindful of increased pedestrian traffic in your neighborhood. Avoid driving in residential neighborhoods during trick-or-treating hours. Turn your headlights on an hour before dusk so you’re more obvious to pedestrians. Stop at intersections, even if there isn’t a stop sign, to let pedestrians cross safely. Slow down, be alert and avoid distractions. Finally, take the pledge for no trick-or-tweeting behind the wheel! 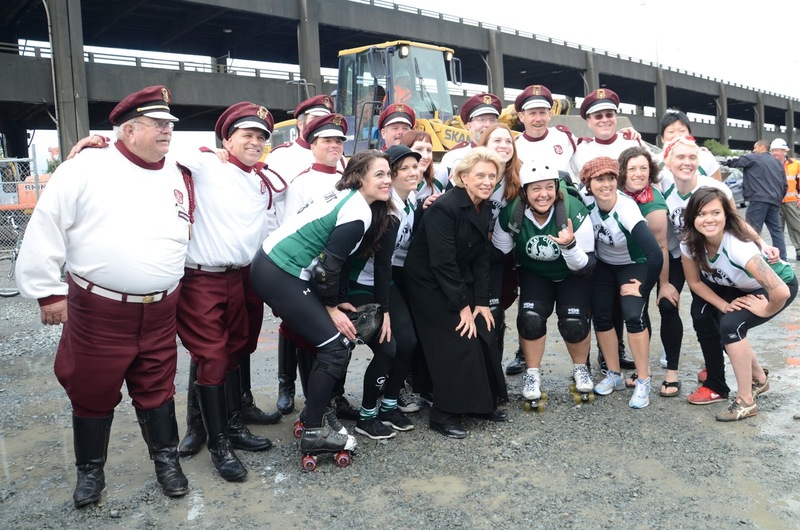 More than 3,200 people came to the Alaskan Way Viaduct demolition event Saturday morning, Oct. 22, to spend some quality time on the city’s historic structure. Many visitors walked onto the top deck to take photos and enjoy the scenery, while others spent their time writing farewell messages in chalk, playing Frisbee, hula hooping, and enjoying a picnic with a view. Another group of partakers, however, were able to experience travelling on the viaduct in a more unique way. Winners of our “One Last Shot” contest got their own special section of the viaduct for 30 minutes to live out their dream proposals, derby and daredevil style. 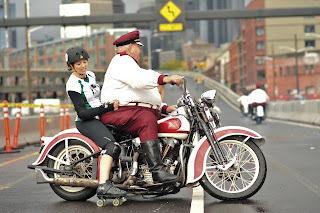 The Rat City Rollergirls skated and bouted on the top deck while the Seattle Cossacks built human pyramids and performed stunts on their vintage Harley Davidson motorcycles. 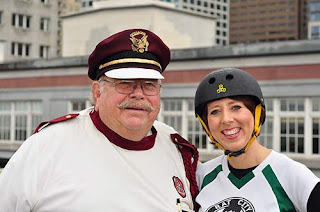 Many thanks to our contest winners – the Cossacks’ Dave Eady and the Rollergirls’ Jenn Harowicz – for submitting their ideas. 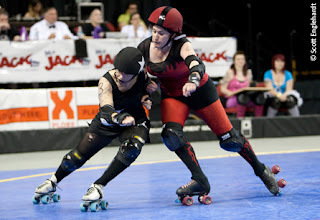 Congratulations to the Rat City Rollergirls and Seattle Cossacks! Everyone had such a great time at the demolition event, even Governor Gregoire joined in on the fun! If you aren't getting a chance to see the demolition of the south end of the Alaskan Way Viaduct first hand we captured some video. You may want to turn your speakers down before playing them, this demolition is anything but quiet. Excitement was in the air as Dave Ross, Seattle’s KIRO-FM radio talk show host, and Ken Schram, KOMO Newsradio host, joined Alaskan Way Viaduct Replacement Program Administrator Linea Laird to decide who was going to win a rare opportunity to spend 30 minutes on a vacant Alaskan Way Viaduct during the structure’s nine-day closure. 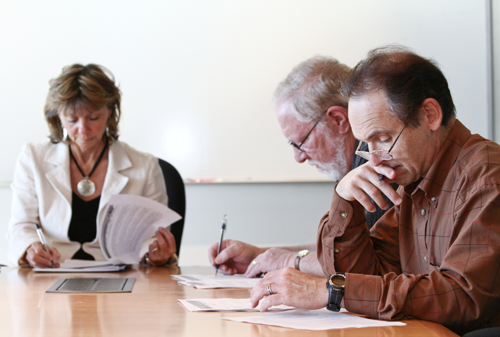 The panel of judges immediately set to work reading through the top 15 submissions, out of nearly 600 submitted to the program. What were they looking for when selecting a winner? They wanted to find the ultimate idea that was creative and unique, fun and family-friendly, and significant for the entrant and our city. Of course, a lot of contest entries fit perfectly into these categories, but didn’t make it into the top list because they weren’t feasible. 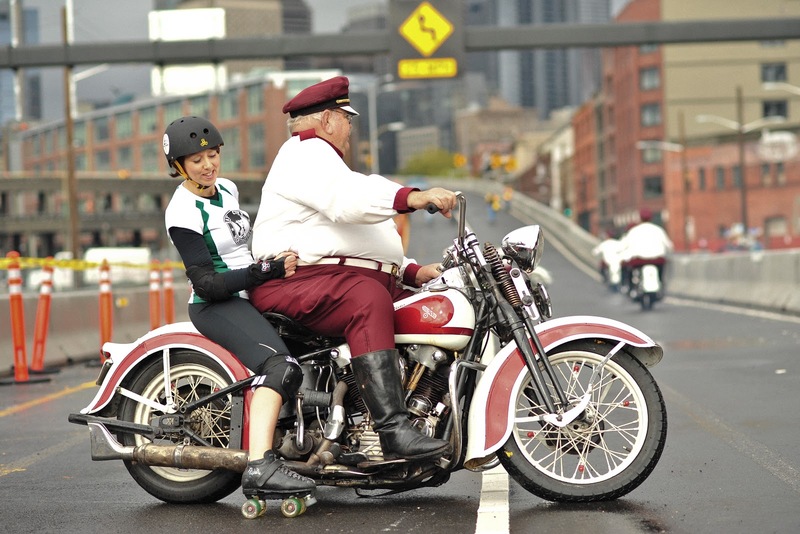 Some of the favorites – rolling down the viaduct in the P.I. Globe, making the world’s longest slip-and-slide, setting up a drive-in movie for the waterfront, hosting an Oktoberfest party, competing in an ultimate dodgeball contest, and having a campout to roast marshmallows, to name a few. With an incredible assortment of entries, debate between the judges broke out immediately. Should we pick the proposal to fly stunt kites, set up model trains, or organize a flash mob? How about the ideas to host a prom, choreograph a Bollywood film, paint a huge mural, or set a world record for the most espresso shots produced? The judges pointed out that they didn’t want to pick an idea that was “Seattle safe.” The contestant field was narrowed down to two without a clear winner. Ultimately, the judges came to a solution - select two winners! 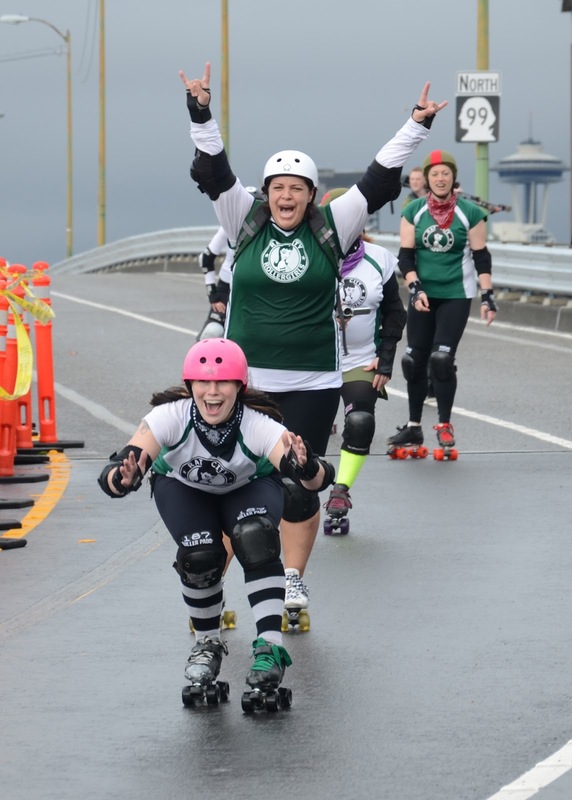 The Rat City Rollergirls, members of the first flat-track roller derby league in the Northwest, won with their proposal to speed skate and “bout” along several blocks of the viaduct. Jenn Harowicz, a mother and work-at-home graphic designer known on the track as “Know Mercy,” secretly submitted the idea without telling her teammates. "What attracted me to derby was that it's women of all ages and walks of life. Each skater has a life outside of derby," she said. Jenn drives on the viaduct daily and made a compelling case in her entry for wanting a unique memory of skating on it with her Rollergirls. 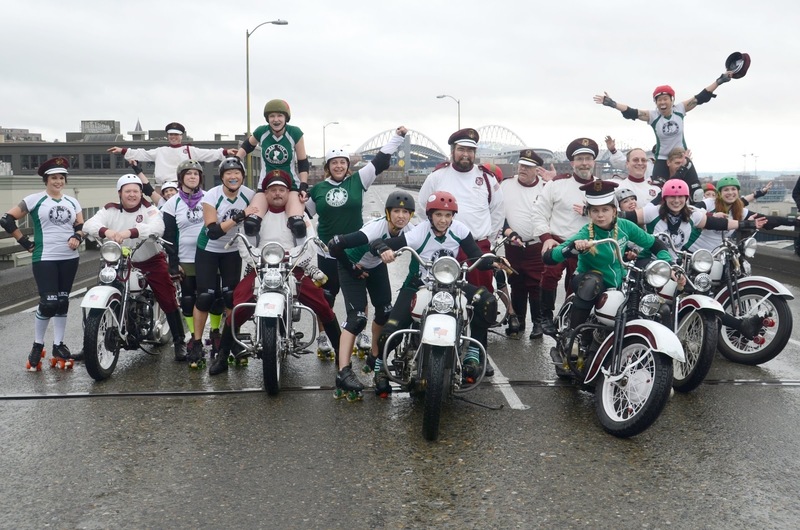 The second winner – Seattle Cossacks – will use their 30 minutes to perform stunts on the viaduct with their vintage Harley-Davidson motorcycles. 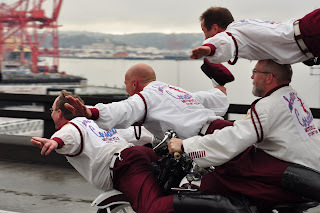 Dave Eady, a life-long member of the group, has been performing stunts on his motorcycle for the last 39 years. He submitted his entry because of the historical significance the group and viaduct share. 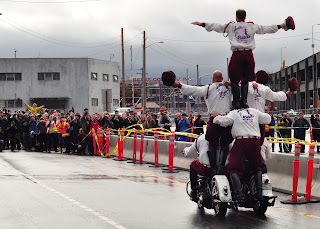 The Seattle Cossacks formed in 1938 and have been taking part in transportation history ever since. 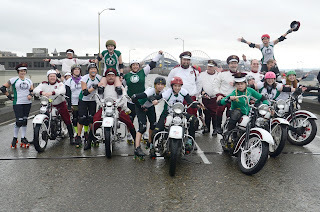 The Cossacks were the first to lead the opening of the original Tacoma Narrows Bridge in the 1940’s, and also led the opening of the Spokane Street Bridge. When notified he had won, Dave became overwhelmed by emotion. “I’m 70 years old, so just looking at me you wouldn’t think I could do something like this, but I can,” he said. Dave wants to share the winning time with his team to say a special farewell to the historical structure. 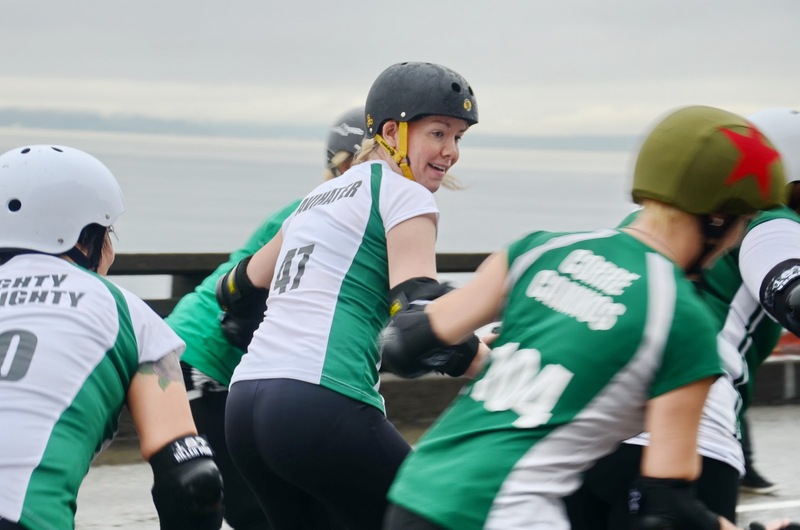 Both of the winning groups are homegrown locals who represent the unique flavor of Seattle. 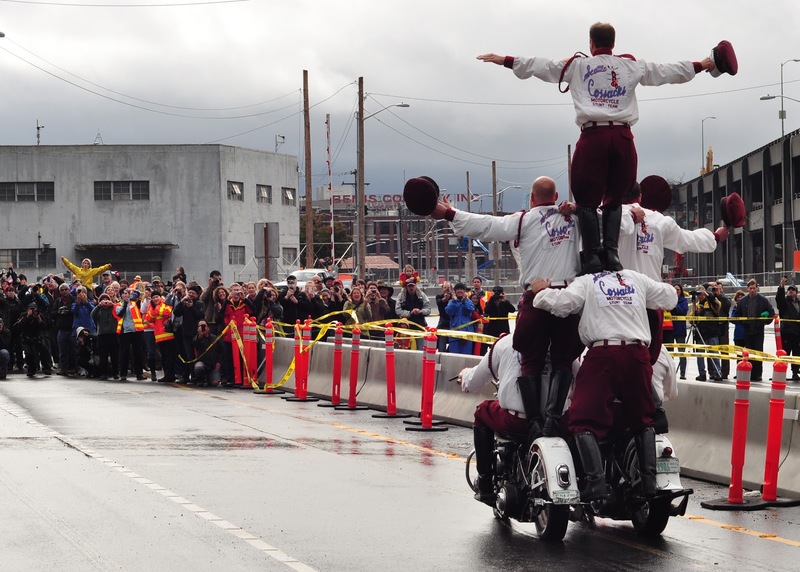 Following their 30 minutes, they will help kick off a viaduct demolition celebration event by performing on the SR 99 off-ramp at 1 p.m., Saturday, Oct. 22. Despite the fact that roughly 85% of motorists used their safety belts in 2009, nearly half of passengers killed in traffic crashes that year (about 11,500) were not buckled up. So, while automakers continue using technological advancements to make vehicles safer, the easiest and safest thing everyone can (and should) do is use a traditional, yet proven safety device that goes back more than five decades: the 3-point safety belt. Since the invention of the modern seat belt more than 50 years ago, enormous advancements in vehicle safety have been made with technologies such as front and side airbags, electronic stability control, child safety seats and so on. Among the latest advances, GM debuted a new front-center airbag that is designed to deploy between the driver and front seat passenger during a side-impact collision. These kinds of technological improvements have drastically reduced the risk of injury and death in the event of an accident, but none of them have a greater life-saving capability than the seat belt. Between 1975—when the 3-point front seat belt became standard in all U.S. cars—and 2009, seat belts have been responsible for saving an estimated 267,890 lives. That’s an average of nearly 11,000 people each year – wives, husbands, brothers, sisters and children – who are alive today because they simply clicked in before they hit the road. Seat belt usage has increased dramatically over the years, with primary or secondary laws now in place in 49 states and the District of Columbia. And yet, despite today’s increasingly high rate of seatbelt usage, we shouldn’t be satisfied as thousands of lives are still lost on our roads each year because they were unbuckled. The new in-vehicle safety technology becoming available is wonderful, but we should always remember that the simplest thing we can do to protect ourselves from being injured or killed in a crash is use a safety belt. Help protect your family and friends by setting a positive example of always buckling up, no matter how long or short the trip. Don’t take chances, take action—buckle up. We have all heard the saying, “Good things come to those who wait.” If you plan to travel over I-90 Snoqualmie Pass this week you will be waiting, potentially up to two hours, but as the saying goes that must mean good things are on the way! Crews have been working very hard this summer to build the brand new eastbound lanes and bridges on I-90 east of Snoqualmie Pass, which is part of the I-90 project that improves a five-mile section of roadway from Hyak (milepost 55) to the Keechelus Dam vicinity (milepost 60). Crews will spend the week paving the transitions between the new and old lanes and by Friday, Oct. 21 the new eastbound lanes will be open for your enjoyment! If the idea of sitting in traffic isn’t want you had in mind this week, avoid the delay by using our travel time graphs (pdf) to find the best times to travel. Want to see what the wait is all about? Here is an up close look at what is going on behind the scenes during the closure. Kitsap County drivers who drive the short stretch of State Route 3 between Gorst and Bremerton aren’t big fans of “rock ‘n’ roll” – at least as far as their commutes are concerned. For decades, the unstable slopes that seem to linger above the highway like a hammer waiting to fall have dropped everything from pebbles to basketball-sized boulders onto the four-lane roadway. And while no one has been injured in these sporadic incidents, this summer we started taking action to reduce the likelihood of any sort of potentially dangerous rock falls in the future. to stabilize the slopes above SR 3. In August, crews from Rock & Company ascended on the scene, scaling the craggy faces of Windy Point to remove loose rocks and other debris from the slopes, using anchor bolts to hold large rocks in place and installing wire mesh fence to further protect motorists. That was the “easy” part. Determining how to best get the 71,000 drivers who travel this section of SR 3 daily past the mile-long work zone was anything but easy. With no available detours, simply closing a southbound lane for the duration of the project would have extended rush hour backups significantly. So our thinking shifted, and traffic lanes did too. We opted to maintain four lanes of traffic on SR 3, but with reduced lane widths from 12 feet to 10 feet through the work zone, and dropped the speed limit from 50 to 35 mph. It was a great fix and one that would prove to significantly lessen backups and delays. This section of SR 3 is sandwiched between the cliffs of Windy Point and the waters of Sinclair Inlet. Shifting the lanes required temporarily eliminating the roadway shoulders, and, in essence, removing the lanes bicyclists use to get between Gorst and Bremerton. A shadow loomed over the traffic shift plan, but was eventually turned to the project’s and travelers’ advantage. We turned the pilot vehicle concept, in which drivers from the project crew lead motorists through work zones, on its ear and implemented a “shadow” vehicle. Through this program, project crew drivers follow, or shadow, bicyclists through the length of the work zone, ensuring a safe buffer between bicyclists and motorized traffic. The number of shadow vehicles committed to the project has been reduced since the program started in August, but the positive effect on bicyclists’ safety and traffic flows will continue until the project wraps up later this month. When it does, the only rock ‘n’ roll on this section of SR 3 will be blaring from car radios. The things our maintenance crews do never cease to amaze me. These are the guys and gals who work through the night during floods and snowstorms, respond to crashes, and remove dead animals from our highways. They’re always going above and beyond to take care of drivers and our highways. This time they went the extra mile to find a missing teddy bear along I-90 in eastern Washington for a six-year-old girl. We first learned of the missing teddy bear when Patty Sweeney posted a message on our Facebook page. The teddy bear belonged to her granddaughter, Justice, who got carsick during a recent road trip. Somehow, Daddy Bear, as Justice affectionately calls him, escaped from the car when they pulled over. It wasn’t until they got home that they realized Daddy Bear was missing. It was a long night for the family -- Justice couldn’t sleep without coveted bear. Her dad, who is now stationed in Korea, gave her the bear when she was two before he left for Iraq. Needless to say, the bear has some sentimental meaning. When Harry Nelson and Terry Kukes, with our maintenance team in eastern Washington, found out about a missing teddy bear along I-90, their own kids and grandkids came to mind. Harry actually recalled the teddy bear he gave his daughter when she was born. Now, his daughter is almost 13 years old and still hangs on to the bear. He knows how important a teddy bear can be. Harry actually used to be a logger by trade. He worked for WSDOT in the ‘80s in maintenance as a seasonal employee. When the logging industry went “timber,” Harry decided he’d better find something more solid than a tree. That’s why he picked WSDOT. He started his second career in 2005, and loves the people he works with. The duo went looking for the bear because, with all the media attention, they didn’t want drivers slowing down along the highway looking for the bear themselves. It just wouldn’t be safe. Amazingly, the guys found the bear after two quick trips through the area where the family thought they might have lost the bear. The guys snapped a picture (insert photo) of the bear and sent it to the family to verify that it was, indeed, the bear. Sure enough, it was the one. What a special moment it was to see Daddy Bear reunited to the arms of Justice. She was so excited. The family never thought they’d see the bear again, but here he was showing up in the unlikely hands of two of our maintenance crews. This 18-year-old high school senior from Garrett, Indiana was not wearing a seat belt when she lost control of her car and slammed into two utility poles and was pronounced dead at the scene. A 15-year-old from Iowa lost his life and injured his 15-year-old passenger, after they were ejected from their vehicle while attempting to catch air under the vehicle on the top of a hill. Unrestrained at the time, an 18-year-old from St. Louis, Missouri was killed when he hit the back of a tractor-trailer that slowed down in front of him. These are real kids, with real families left behind…and it’s happening every day in this country. We owe it to our children and society to do better, because the rate of teen crashes should be unacceptable to us all. Recent research by AAAFTS found that teen drivers are 50% more likely to crash in the first month of having a license than they are after a full year of experience and most crashes tend to involve three common mistakes – failure to reduce speed, inattention, and failure to yield. During the upcoming Teen Driver Safety Week (October 16 – 22) make teaching your child to drive safely and responsibly a priority. Talk with them. Drive with them. Lead by example when you drive, because they are watching and modeling you, even if they aren’t old enough to drive yet. Driving comes with a wealth of dangers no matter who is behind the wheel, but proper education and experience in varied, real-world driving scenarios are the keys to combating those dangers. Parental involvement is essential for exposing teens to different scenarios and the development of good driving habits, even after the law allows teens to drive solo. Practice, practice, practice: Ensure that basic skills are mastered and to introduce varied driving conditions (snow, heavy traffic, rural roads) with an experienced driver in the passenger seat. Keep passengers out: Teen drivers’ crash risks multiply with teenage passengers in the vehicle. Set limits and enforce them consistently. Limit night driving: Reduced visibility makes night driving riskier for inexperienced teens. Allow new teen drivers to drive at night only if truly necessary or to practice with a parent. Keep setting rules: Parents can – and should – set and enforce rules above and beyond their state laws. In addition to night and passenger limits, set rules for inclement weather, highways, cities, or other driving conditions in which a teen has not gained enough experience. Find a parent-teen driving agreement on TeenDriving.AAA.com that can help. Finally, help us spread the word. Talk to others in your community about teen driver safety and forward on this information through your social networks – it just might save the life of a teen. What would you do if you had exclusive access to the Alaskan Way Viaduct for 30 minutes, free of cars and people? Maybe celebrate a birthday, propose to your significant other or play flag football? That’s what we want to know. We are sponsoring a contest where one lucky person and 24 of their friends will win access to the viaduct’s downtown section for 30 minutes on Oct. 22. Starting Oct. 21, the viaduct will be closed for nine-days in order to demolish the southern mile and transfer traffic onto the new southbound bridge that is nearly complete. To enter, answer the question “What would I do with 30 minutes on the Alaskan Way Viaduct?” in 100 words or less and send it to viaduct@wsdot.wa.gov by Sunday, Oct. 16. Entries will be judged on how original, creative and fun they are. The winner will be escorted to a private section of the viaduct at a predetermined time to follow through with their plan. Check the WSDOT website for contest details, rules and restrictions. For those who don’t win the contest, and anyone else interested in spending a little time on the viaduct before it’s demolished, there’ll be a commemorative walk on Saturday, Oct. 22. This is a perfect opportunity to get a firsthand perspective as this historic event unfolds. Attendees can also take home a commemorative piece of the viaduct. We have a lot of work to do on the viaduct from the demolition site in SODO all the way to the Battery Street Tunnel, and you’ll see much of it in action (including demolition) if you participate in the walk. We worked with the contractor to find a time and place that lets crews stay on schedule and stays out of the way of construction activities. Parking is available for cars and bicycles in the fenced construction site just south of Railroad Way South and on adjacent city streets and in nearby pay lots. We encourage attendees to take light rail, or the bus. The closest light rail stop is Stadium Station. at BNSF's dispatch center, alerting crews of the problem. Anyone who follows the news knows that mudslides in western Washington are a pretty common occurrence, especially in the rainy fall and winter months. When a slide affects the rail lines, it creates major disruptions for passenger rail service. Nearly 130 Amtrak Cascades passenger trains were delayed or canceled in 2010 because of mudslides and hillside washouts, and so far in 2011 that number has almost doubled. For passengers, these disruptions are a major inconvenience – after all, who wants to make connections by bus when you’ve paid to ride the train? And for us, it makes our goal of improving Cascades service reliability and on-time performance even more challenging. The good news is that we’re working with our rail partners to meet Mother Nature head on, taking major steps to reduce the potential for these disruptions and reduce the amount of time passenger trains sit idle after a mudslide. Action can’t come soon enough, since Amtrak Cascades service was shut down for two days earlier this week, due to a mudslide near Titlow Park in Tacoma. Mudslides, and the fact that the route is congested with scores of daily freight trains, has prompted us to propose rerouting passenger trains away from BNSF Railway’s main line to an existing rail line through south Tacoma, Lakewood and DuPont. The Point Defiance Bypass project will greatly reduce disruptions and help the Cascades stay on time and on schedule. We are currently studying the impacts of rerouting the service and hope to have approval from the Federal Railroad Administration to move forward by 2013 with trains running on the bypass by 2017. The bypass is one of 20 projects in our Cascades High Speed Rail program aimed at increasing the frequency and reliability of Amtrak Cascades service between Vancouver B.C. and Portland, OR. 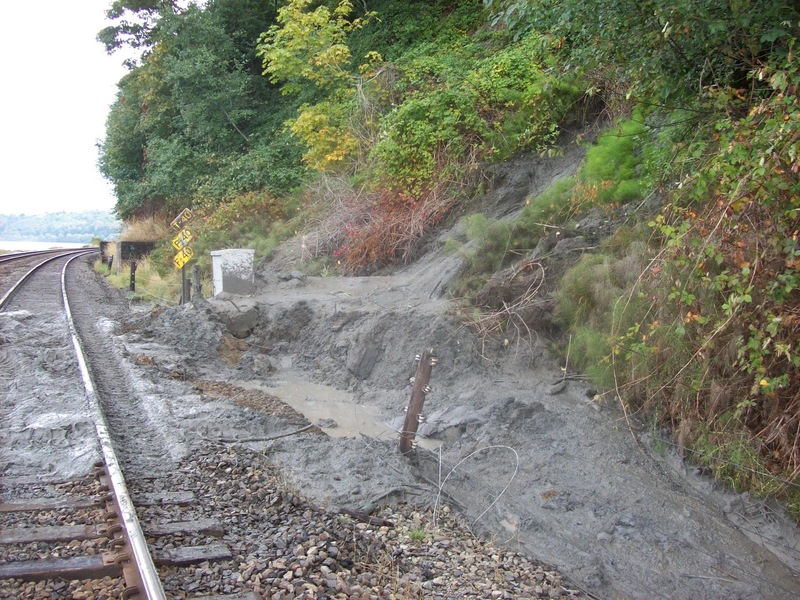 Recurring mudslides in several places along the rail corridor prompted FRA and WSDOT to dedicate $16.1 million in federal high speed rail funding to identify unstable slopes along tracks throughout western Washington. 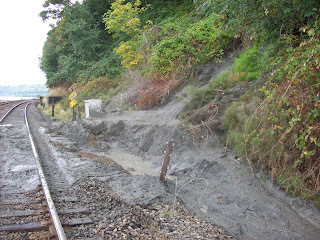 WSDOT and BNSF will work together surveying problem areas and determining appropriate fixes to reduce mudslide delays. Work is expected to begin next year. In the meantime, we’re working with BNSF to explore new ideas for getting passenger trains up and running more quickly after a mudslide while continue to insure the public’s safety. BNSF’s current policy restricts passenger trains for 48 hours after any mudslide that affects the tracks. 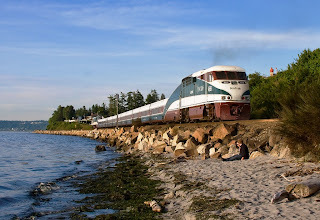 We are working very hard to support, improve, and promote Amtrak Cascades as a viable transportation option. These changes will help us take passenger rail service to the next level for our next generation of riders. to work at Island County Human Services. Funny thing about the people of Coupeville – they seem to actually enjoy their daily commutes, even on Mondays. 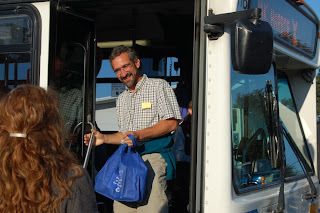 And ever since the town launched a unique community-based trip reduction program to help curb greenhouse gas emissions a year ago, witnesses have reported spotting folks in Coupeville smiling on their way work. “Mostly I use my leg power, but when I need a boost on the big hills I can use the electric power,” Coupeville Dentist Julie Grove is happy to tell just about anybody who asks about her electric bicycle, which she rides to work four days a week. Smiling Coupevillians are catching the bus, sharing a ride, working at home instead of the office, walking and biking, perhaps more than ever before. They’re raising the bar for trip reduction in Island County. When commuters smile in Coupeville – or anywhere else in our state – we smile too. Seems our strategy for getting people to think about driving alone less often is catching on. A year after this town with a population of 1,800 launched its “community trip reduction” program, more than 160 people – 9 percent of the town – have signed up on RideshareOnline.com and discovered it’s easier than they thought to leave their cars at home and save a whopping 39,493 gallons of gas and more than $281,600 in commute costs. Back in July of 2008, the town hired Cathy d’Aldmeida to find new ways to reduce greenhouse gas emissions and protect Coupeville’s gorgeous natural setting. D’Almeida rolled up her sleeves and joined forces with Sustainable Whidbey Coalition; Island Transit; local employers, such as Island County and Whidbey General Hospital; the Washington State Department of Transportation (WSDOT); and RideshareOnline.com to develop a plan that would target the biggest source of greenhouse gas – transportation. Trip reduction programs have been targeting emissions, fuel consumption and congestion in urban areas across the state for nearly two decades with the statewide Commute Trip Reduction (CTR) program. It focuses on large employers in urban centers to encourage workers to drive alone less often. While Washington State is considered a national leader in trip reduction, the state’s existing programs didn’t extend to small towns like Coupeville. Unlike the urban parts of state where hours of traffic congestion every day is motivation enough for many people to join a vanpool or take the bus, Coupeville’s small-town rush hour lasts only about 15 minutes, d’Almeida said, so she had to get creative. For many, cleaner air, energy conservation and cost savings made an effective call to action. For others incentives of a different kind – the chance to win a $50 gift certificate to a local business – did the trick. 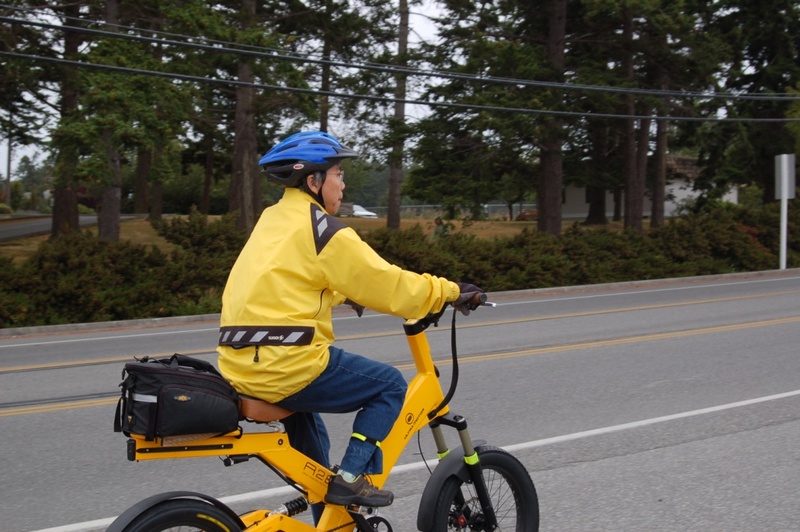 When Coupeville’s rideshare program celebrated its first anniversary in August, the numbers indicated those incentives – personal, environmental or foldable – are paying off. In just one year it prevented more than 347 metric tons of C02, a greenhouse gas, from entering the atmosphere. For us this small town’s big success means investing in programs that ease the demand on our transportation systems and protect the air we breathe make sense not just for the state’s congested and urbanized cities but in every community where people travel. To learn more about RideshareOnline.com including recent upgrades visit www.wsdot.wa.gov/Transit/Rideshare/RideshareOnline.htm. For more information about WSDOT’s efforts in reducing greenhouse gas, visit our sustainable transportation page. Find out what else the Sustainable Whidbey Coalition is working on. For the fourth consecutive year the AAA Foundation for Traffic Safety’s Traffic Safety Culture Index has found that drivers exhibit a “Do as I say, Not As I do” attitude when it comes to using cell phones behind the wheel. According to the 2011 findings, 95% of drivers consider texting while driving a serious threat to their personal safety. Yet, more than a third of drivers admit to texting while driving in the past month. If that isn’t alarming enough, 88% of drivers also view talking on a cell phone as a safety threat, but a staggering two-thirds fess up they’ve done so themselves in the past month as well. Addressing this disconnect among motorists thinking something is unsafe and actually doing something unsafe, is the driving force behind Heads Up Driving Week. Running from Sunday, October 2 through Saturday October 8, the Foundation and AAA are promoting this campaign to get drivers to pledge to drive distraction-free for one week. Committing to one week will remove distractions during that time and hopefully show drivers that eliminating distracting habits behind the wheel makes the road safer for everyone. More than one million people have died in motor vehicle crashes over the past 25 years in the United States, including 32,788 in 2010. In 2009, 5,474 people were killed and an additional 448,000 were injured in distraction-related crashes. Studies indicate that cell phone use while driving roughly quadruples one’s risk of a traffic crash. Driving distracted makes even the safest driver unsafe. This week the AAA Foundation is calling on all drivers to “Try it for a Week, Do it for life”. You can make the conscious and collective decision to put down the phone and become part of the solution, not the problem.